The bitter cold that a "polar vortex" is pushing into much of the United States is not just another winter storm. 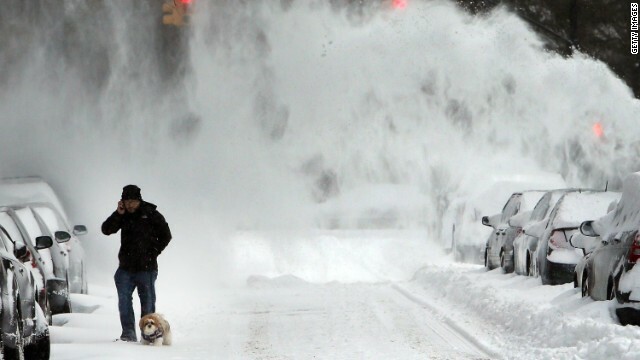 It's the coldest in 20 years in many areas, and breaking some records. Full story here. How far below zero does it have to get to cool off the global warming debate? Tonight Van Jones and Newt Gingrich host Crossfire with guests Navin Nayak, who wants climate change legislation and David Kreutzer, who's against it. Besides the freezing cold weather, another topic on many Americans' minds is the college football BCS National Championship game where Auburn squares off against Florida State. Who do you think will win? Vote by tweeting Auburn or FSU using #Crossfire or comment on our Facebook post. View results below or through our Poptip results page. so when this summer is the hottest ever, will change your tune again? PAY Close "ATTENTION" World Leaders. Soon all will take note to the sounds and rumbling of Volcanoes and Earthquakes Around Earth that are Waking Up at a Alarming Rate. Just as they did in 1883 from Krakatoa. All going a little blind. Or have put blinders on. You need to listen to Admiral Samuel J. Locklear. Or just read below. This is not a game or joke our Sun gives off a Solar Wind all day year round if you live in the State of Alaska you see it in the sky above what a sight it is going through our Earth’s Magnet Polls of the North and the South, North Poll. It’s called the Northern Lights or the Aurora Borealis. The day will come when you will be able to see it all over Earth as in the year 1859 Solar Flare, It was the largest in 500 years. Two Astronomer’s Hodgson and Carrington told the World that the Solar Flare made a Geomagnetic Storm reach Earth in hours not days. Back then it gave new meaning to Reach For The Skies from Telegraph Operators. For hours sparks flew from the key board. Even after the Batteries were disconnected. Nov 3 and 4, 2003 had a X40+ Class Solar Flare. Our Sun’s UV Rays will get stronger as each passing day goes by, read and i will tell you why. The Great big forest have be stripped from most of the Earth for Greed of Money by the Wicked. The trees are our Main Source of Oxygen on this Plant. The Forest Trees do more than just make Oxygen they stop Soil Erosion, just Look at the 1930 Dust Bowl. Greed by our Government taxes led farmers to clear cut all their Forest and farm all the land they were being Tax on. They had to farm it to pay for the Taxes. Why leave the Trees when food crop makes Money. This Did not Help the Depression that effected most all Worldwide. In the next coming years more than 100 million will suffer from Malnutrition lack of food and Dehydration lack of water. Many will not make it and die! Soon many will run out of Safe Drinking Water from pollution going into the worlds water supply. One country can see clearly and knows already the World's food and safe drinking water supply is running out at a record pace. food or grain from INDIA to any other country. China is trying to buy up all the world's grain it can and the future harvest of framers. China is also right now working on passing laws on its farmers. Rural Reforms on Farming. It to soon will become a country that will not export any of its food or grain. In the United States of America alone more than 46+ Million Americans Received Food Stamps and that number is going up every day every year for more than 4 years in a row now. Obama building back up America or tearing it down and apart? Less Forest less Oxygen this is why the Moon. That has no Oxygen is very cold on the side with out Sun Light, And hot as ever on the side with Sun Light. Way too cold and too hot to live there. You would need at least 10 times the Energy we use on Earth to even live there and life on the Moon would be very short. Soon the Sun’s Solar Wind and UV rays will be way to strong for most to go out in the Sun Light for even a short time. The Geomagnetic Storm to come and the Bad Weather Storms well you have not seen nothing yet and the Sea Level is Rising the Oceans.The Sun Rays is leading to the Drying of Fresh Drinking water. Many Lakes World Wide have set records for all time Low Water Level. Many Millions have been affected by Floods in China and Pakistan just last year. In 2005 Over a Thousand dead in New Orleans flood, and the list going on. The sounds and rumbling of Volcanoes Around Earth are Waking Up at a Alarming rate. The last 30 years On Earth we have broke all High Temp Records and the temp it is still going up. All the Worlds Ice Glacier are melting at an Accelerating Rate. The Glaciers and Polar Ice Caps store more water than all the Fresh Water Lakes on Earth. Many of them are drying up or water levels are going down past the lowest point every recorded. Scientist Dr. Katharine Giles was killed in a cycling collision in Victoria, London. She is the second person from her UCL department to die in an so called accident. and showed to governments around the earth how the Sun rays and winds affected the newly exposed Arctic Ocean. Some of Scientist Dr. Giles research focused on using satellites to better understand the physics of the ice covered polar oceans. Scientist Dr. Giles to all Warning Water will warm much faster then ICE water. They will get even bigger and worse less Oxygen the more UV Rays to the Earth and more Water molecules will evaporate and go up into the Earth’s Atmosphere. Less Oxygen the colder without sun light and hotter with it. The Sky full of more water vapor molecules, more snow in the winter and more Flash Floods in the Summer. All earth will see way more fires and the Deserts are growing larger. All over earth they are building underground why? You do not need to ask why if you read the above. The United Nations is now taking a serious look into "Earth's Limits" Earth will very soon be at its Limits of no return for many things including all life on Earth. If we keep going at this rate we will not have another 20 years to go back to Rio De Janeiro to play. Most all in the Scientific Community said this 20 years ago at the last time Leaders set up this meeting in Rio De Janeiro. Of course on the Tax payers money, and of course they said about the same thing again we need to do something! There is enough Energy from our Sun to Power all are needs on Earth and more. The Fastest growing energy on Earth. The Freedom to get your own Power from the Wind and Sun, Solar Energy has been there for years. Are Libraries and Schools should have been the first to have gone Solar and Renewable Energy. And why are they not? Churches are all over the Planet. They are going to Solar Energy. In many cities and more added every day there are more Electric Charging Stations than Gas Stations. Please go to (Electric Vehicle Charging Station map) Oil CEO's soon to lose more than their shirt. FREE SOLAR ENERGY FROM THE SUN. Why KEEP sending your $$$$$ to the Middle East. Canada is next door Obama and is one of our closest allies. Canada keystone pipeline in January 2012, President Obama put the brakes on and rejected the application. We should have done all we could to have completed the project long ago. Why is not every GOVERNMENT BUILDING IN THE USA COVERED WITH "USA BUILT" BUILT IN AMERICA (PV) SOLAR ENERGY WE WOULD BE SAVING MILLIONS AND PUTTING MILLIONS TO WORK. (PV) SOLAR ENERGY is even in use at the SOUTH POLL STATION. It's all Al gore's fault! Not to fear The President before xmas said he was going to tackle Global Warming so it's a sure thing to plan on nothing happening in the near future as he will be back selling insurance any day I'm guessing next we will be mandated to buy Amway products to finance his library!!! Up until today I believed in global warming. I thought the ozone layer hole was in the artic, and that in the summer the sun rays penetrate the ozone hole. Then as the earth tilted in the winter, then the cold of outer space could also come in the same hole. Well that idea just fell flat on its face. The ozone layer hole just happens to be in the Antarctica and the hole in 2013 just happened to get smaller. So I guess I'm saying the planet is cooling and not warming. But then Hume am I to say that. It's called "global warming", not "United States warming." Funny how so many ignorant people cannot understand the difference. Do they think that where they live is the whole world? Where does our warm weather come from in the eastern US? The gulf stream, which brings warm currents from the tropics. When the north pole keeps getting warmer (as it has been), it continually drops ice into the northern Atlantic ocean, thus cooling and weakening the gulf stream. This should lessen our warmth, not increase it. When I studied the long-term effects of polar warming 10 years ago, the prediction was that the eastern US would get COLDER, with wetter summers and longer winters. Sound familiar? While the average global temperature rises (no one disputes that this is happening, the debate is over WHY), the eastern US and western Europe will get colder, period. North Carolina will become like New York. New York will become like Nova Scotia. It's only a matter of time. I dispute it. It's no warmer now than it was 50 years ago. What's the next "convenient" term? The seventies "global cooling" thing is a bit of revisionist history. Global warming caused by human production of CO2 was first scientifically quantified by Svante Arrhenius in 1896. In the following years, it became an accepted part of science... man was creating CO2, and CO2 caused the earth to warm up. But in the early 19th century, there wasn't enough CO2 being produced to worry about. But CO2 causing increase was scientifically accepted. In 1971 S. Ichtiaque Rasool and Stephen H. Schneider wrote a paper showing the possibility of global cooling. When this paper went through peer review, it was found (by Schneider himself no less) that there were mathematical errors in the paper and that the real conclusion was WARMING, not cooling. By 1972, the scientific community had dismissed manmade global cooling. Instead they believed that a natural cycle was heading toward a cooling cycle but that man's activity was making things warmer. Then in 1975, Newsweek released an article on Global Cooling that set people abuzz. THe problem... is it wasn't a scientific article. It didn't include any of the scientific research of the time on climate change. Because that science was all pointint toward a warming effect of man's influence, not cooling. People who talk about global cooling in the 70's are talking about a single disproven scientific paper and a Newsweek article. They are NOT talking about what science at the time was arguing. Since the 1900's, scientific research has firmly supported that man's activity (specifically CO2 production) causes an increase in average earth temperatures compared to what it would have been had the CO2 not been put there. No real scientists supported the idea of global cooling. I never even heard the term until propagandists starting using it in recent years. Global cooling was a term used by the liberal democrats of the day. You can't run from the liberal history of that era. You people can't even make up your minds on what is happening. It was called 'global cooling' 40 years ago. Perhaps you are too young. Dirty weather, rotten ice, climate weirding, extreme weather...and now trending...polar vortex. I think "global warming" is a better term than "climate change". The climate is just the atmosphere, but the oceans are warming up too. Newt Gingrich is a pretty good science guy, I'm surprised he doesn't get it about global warming. He was wrong when he said the atmosphere hadn't warmed up. Just because we're having this cold snap, that doesn't mean global warming was a mirage. Science data is hardly ever neat and tidy. A river goes down to the sea, but it never goes straight down to the sea. I wouldn't be at all surprised if this cold snap is a consequence of global warming. LOL! Really?! Are you serous? The science is not there. Green is the new redistributive socialist red. We know that increasing the CO2 in an atmosphere will increase the temperature in that atmosphere compared to what it would be otherwise. Simple experiment really... take two air-tight fish tanks with thermometers in them and place them side by side. Pump one full of C02, leave the other with normal atmosphere in it. Leave 'em out in the sun. The one with CO2 in it gets hotter. So... CO2 increasing temperatures compared to what it would be otherwise is experimentally proven. We also know from measurements that man produces MORE CO2 in a year then the measured increase of CO2 in our atmosphere each year. This means that without man's contribution, CO2 levels would be decreasing. This is why pretty much every scientist who is actually credentialed in climate studies or any related field agrees that man made global warming exists. Because the science is pretty air-tight. CO2 causes warming... and man produces a ton of CO2. It's not complicated. So... the only real question is how big a deal is it. That's worth debating... but not if man is causing increased CO2 levels which causes increased temperatures (compared to what they would be if the CO2 weren't there). People think that means temperatures should go up all the time if it's true. That's simply not the case. Our sun doesn't always produce the same amount of heat. Weather still happens in local patterns that can cause it to be colder some years then others. The key is that without man's CO2 contribution, it would be COLDER on average world wide... not that it will be warmer this year then last year. Kurt keeps saying the science is there, and to a point he is correct. But what the science shows is a moderate amount of warming, insofar as actual observations are concerned. Setting aside the various debates about the amount and timing of such warming, I think we can all agree that over the last 100 years, the Earth has warmed a bit, whatever the cause may be. But what the philosophy of climate change catastrophe is based on is not this easily accepted notion. Nor is it based on the amount of warming that can be expected from CO2. It is widely acknowledged that CO2 will cause some warming, but not anything near catastrophic warming. The basis of such ideas is that warming is "amplified" by increased water vapor in the atmosphere, driven there by the increased warming caused by CO2. This amplification is required in order to "project" the catastrophic levels of warming, and such levels of warming are not seen in reality, but seen only in the output of "climate models". Climate models are simulations carried out in a virtual domain, and they are not actual observations of anything, except perhaps the performance ability of the model when tested against reality, in the form of actual observations. In this regard, the climate models relied on by the IPCC are bunk, as they overwhelmingly run hot against observations. They are wrong in many other respects, but rate of warming is the key metric at which they fail. Actual observations of water vapor call in to question the notions which have been programmed into the virtual models. While CO2 rises, there is no corresponding trend in WV, considering again only actual observations. This enhanced feedback effect is not seen in nature, and is only seen in the virtual domain of the models. Without a doubt, the output of the CMIP5 model set is not even close to actual observations, when compared against satellite, balloon and radiosonde datasets. It cannot be overemphasized that the entire notion of catastrophic climate change rests squarely and exclusively on the output of a series of computer models, which are drifting further away from reality with each passing day. The CMIP5 models grossly over-estimate the rate of warming, largely because they over-estimate the WV feedback. The output of computer models is not science, as science rests on observations. And a computer simulation in a virtual domain is not what I would consider observation-based science. Actually those experiments dont work .... Check youtube for numerous examples one reason being that glass is opaque at the ir absorbortion of co2. Also shouldnt fill with co2. Should just breathe into before closing lid. Everything you think you know is wrong. But please try the experiment and get back to me. I have done the experiment. Put the tanks out at 9 AM on a sunny day in May. Came back at noon. CO2 tank had about a 1.5 degree increase in temperature. Look, this isn't rocket science. The first experiments like this were done in the late 1890's when the concept was first shown scientifically. CO2 causing temperature increase isn't some sort of new idea... it was first written about in scientific journals in in the 1890's and despte 120 years of scientific review is still accepted science. Who cares. The whole notion of AGW is not predicated on CO2 in any case, it is predicated on an increased in water vapor, purportedly caused by an increase in CO2. The increase in CO2 alone is widely acknowledged as being insufficient to cause the claimed increased in warming projected by the IPCC's computer games. It is the water vapor that is responsible for most of the warming shown in the video toys. Is the water vapor content in the atmosphere rising in tandem with CO2? The answer is: No. Water vapor does not cause warming. It amplifies the warming caused by other factors (such as CO2). Water vapor only traps heat for a few days. Then... it rains. The vapor is gone, and no more heat is trapped. The amount of water vapor an atmosphere can hold is determined... by temperature. So the more temperatures rise, the more water vapor is present. A warming effect from CO2 is AMPLIFIED because it resuts in more water vapor which also has short term warming impacts. But the key point is the amount of water vapor the atmosphere can hold is in equilibrium. As rain falls, more evaporation occurs. The amount of water vapor is DEPENDENT on temperature. It will rain off excess water or evaporate new water too quickly for it to change global temperature on its own. CO2 in the atmosphere on the other hand is not limited by the temperature of the air, and it stays in the atmosphere for centuries. Water vapor levels always follow temperature. It is impossible for them to drive temperatures... because the amount of vapor is dependent on the temperature of the atmosphere. On a side note, water vapor is one of the potential causes of an END to a warming cycling caused by CO2 increases. As temperatures increase and more vapor enters the atmosphere, cloud formation increases. Clouds reflect sunlight and reduce the heat we recieve from the sun. Scientists think that while the cycle of CO2 being released from the oceans in the past are what cause the warming to continue to grow, eventually the clouds get too thick and the sunlight being reflected cause cooling of the oceans, which then ABSORB more CO2 from the atmosphere causing cooling to continue until we possibly hit another ice age with decreasing temperatures. In the past though, CO2 emissions from sources other then the oceans were miniscule. Today that's not the case... so we don't know if nature (though clouds and algae blooms) will create enough of a cooling effect to stop the heating trend. Water vapor is the most important greenhouse gas, and it regulates the temperature of the Earth. But it is not a driver to temperature it is dependent on temperature. What determines the amount of water vapor an atmosphere has is the temperature of the atmosphere. YOu can't put more vapor in the air to increase temperatures because you can't. It will rain. Some OTHER factor has to increase temperature (such as increased CO2). This then allows more water vapor to be held in the air so the temperature increase is amplified by the additional vapor in the air and the greenhouse effect it has. You can't just add water vapor to the atmosphere and expect warming to kick off. You have to raise the temperature in some other manner... or the excess water vapor will just turn into liquid water before it has any effect on the temperature of the atmosphere. To be clear...I do not have an issue that adding some CO2 to the atmosphere may result in some warming, although the jury is still out in my opinion. My point is that the IPCC, and specifically the CMIP5 model set, does not rely on the warming effect of CO2 to project the outlandish increases in temperature claimed. The majority of the claimed increases in temperature resulting in the projections of the models is not due to CO2, but to the effect ascribed by the models to water vapor. The underlying assumption is that CO2 will increase temperature, which will increase evaporation, which will increase water vapor content in the atmosphere. In the context of the IPCC models, it is water vapor which leads to the additional increases in temperature beyond that which can be ascribed to CO2's effects alone. I am not commenting on whether or not I think that this is rational, only that this is the way in which the models have been programmed to perform. The projected warming is due somewhat to CO2 increases, but mostly due to increases in water vapor, as output by the CMIP5 model set. Against this backdrop, my point is that there is no corresponding increase in water vapor observed in the real world. Socialism is when the government owns the means of production, which would mean taking over Apple, Microsoft, Budweiser, Coca-Cola, etc. Show me one person in this country calling for that. You can't, because you are a propagandist without any real-wold knowledge. Fact: the United States is 0% socialist. The government owns NONE of the means of production. It's not even possible, given the capitalist global economy that we live in. Reading the "inconvenient skeptic" really helped me understand the science and issues in the Climate debate.. I would recommend it to EVERYONE interested in "Climate Change".. Eye Opening!!! I don't understand how these silly liberal/environmental proponents of climate change without science background (the rep with Biology background doesn't count for science or climate change – Newts amature paleontologist bent does). I don't know why no one is pointing out what a huge disaster Kyoto Treaty was on last 20 years of emissions growth – non of 18 signature countries made any of their goals and the non-developed countries like China, India, FSU have leaped to #1, 4 & 5th spots as polluters! All of this debate and push for regulation is because it was voted down for extension by Japan, Canada, US, Russia and several others – only China & the rest of developing countries are trying to keep it alive because of huge cost benefits from not doing emission regulation. Nothing should happen in US till these countries are brought in line with requirements of the developed (now bankrupt) countries. The facts are the normal state of Earth is to be locked in 100,000 yr ice age that is only broken by 10-20,000 year inter-glacial periods of warming before going into another ice age. We are at 15,000+ on current Interglacial (Global warming real life) and countdown to next ice age is already in motion. Mans impact on Global warming is insignificant – 12 active volcanoes and rift ocean floor emit more than all man's emission. Next CO2 is one fifth of our atmosphere – without which no life could exist so to call it a pollutant is beyond absurd at any level. There is only so much land that is capable of growing food source (arithmetic number) and to cope with growing number of animal/people needs (geometric) the CO2 supply has to increase – if not from normal emissions then it will from huge reserves in air, land & water. And all the recent science has proven how false assumpitons were in Climate models – Earth Satelitte showed Earth is losing 2X as much heat as we projected. The true temperature profiles projected by liberals before climategtate prove dogleg growth is false cherry picked temperature data. Almost none of what you wrote is actually true. You are just repeating fake propaganda from non-scientists. The CO2 in our atmosphere followed a very consistent pattern based on natural cycles for as far back as we can measure in the ice core samples: about 600,000 years. You can easily find this data yourself. Then, after the industrial revolution, the CO2 skyrocketed, and this unprecedented increase correlates EXACTLY with the rise in global temperature. Address that reality if you want to be taken seriously. Easy. Correlation is not evidence of causation. Done. Not actually true... Co2 increases follows increases in temperature. The earth has been warming at one degree per century since the last ice age and since this last little 17 year plateau in rising temperatures the rate of rise is consistant... Co2 has been as much as 25 times greater than today and life florished. The real danger would be if co2 dropped too low so that plants died and life on this planet would be as dead as a norweagean blue. "Not actually true... Co2 increases follows increases in temperature." The solubility of water for CO2 falls when temperature rises. Essentially, the trapped CO2 in the water is released as temperatures rise. The date for the CO2 levels lagging the temperature levels tells us one thing... the initial incident that starts the warming trend (often ending ice ages that we have sporadically), was not an influx of CO2. This is reasonable... because there really aren't extended volcanic eruptions or forest fires that create enough to drastically alter the CO2 balance occurring naturally. The last ice age ended in the following way (according to a 2012 study by Jeremy D. Shakun) is as follows. 3. The atlantic ocean circulation was disrupted by the fresh water. This caused the southern hemisphere to start warming 18,000 years ago. 4. The southern ocean warmed up enough to cause the water to retain less CO2, releasing it into the atmosphere. 5. The increased CO2 (NOT orbital changes) then causes the temperature to go up more, releasing more CO2, causing more increases in temperature. The key point is that the southern hemisphere warmed BEFORE the CO2 increase (due to the orbital shift giving them more intense sunlight). The northern hemisphere warmed AFTER the CO2 increase (due to CO2 trapping heat). CO2 levels don't end ice-ages... but they cause a small initial change in temperature to keep causing temperature rising (as opposed to just the initial increase caused by orbital change). The 2012 study provided ice core evidence confirming this, but it was predicted by climate scientists back in 1990. It doesn't refute the idea of global warming... we've long expected that the initial cause of warming couldn't be CO2. Where would it have come from? CO2 is what institutes the chain reaction that keeps the warming trend continuing over time. Also important to note, the CO2 impact is actually the only way science can explain how seemingly insignificant orbital changes can get us out of ice ages. The actual change in temperature caused by such shifts is minute... only the warming impact of the CO2 being released can explain how the temperature continues to rise and causes the ice age to end. There's no alternative scientific theory explaining the end of ice ages BESIDES the magnifying impact of global warming. The orbital change alone simply doesn't produce enough heat to get it done... Global Warming needs to exist to explain it. His degree is biology AND environmental sciences, FYI. Environmental Science degrees include education in ecology, physics, minerology, oceanology, geology and atmospheric science. It in the degree that is probably most well equipped to talk about global warming as it covers more then just the atmospheric aspect. The question Van Jones did not ask is what are these guys getting out of denying climate change? Who is paying them? Is it all about money and profit for them? Why would you even deny the possibility that it is happening if you might be putting future generations in jeopardy? Do they care more about money than they do about their own children? Maybe they care a lot about the future of their children, and the world they will be living in. Maybe they are hard-core environmentalists. Laugh all you want, Rob. For years I have been railing against the fact that what used to be called the environmental movement has been hijacked by social(ist) engineers for their cause, to be used to drive redistribution of wealth using AGW as a philosophical fig leaf. And as a result, resources and attention have been diverted from REAL environmental issues, for which REAL solutions are required, and from which REAL negative consequences arise. For example, pollution. Even this has been bastardized so that the only pollution we hear about is "carbon pollution", although it's not even the right carbon pollution. "Carbon pollution" is used by the eco-jihadis to refer to CO2, but CO2 is not carbon. Roughly, it is 1/3 carbon and should more properly be referred to as oxygen pollution. And such carbon, being bound to oxygen as a dioxide, has as its primary purpose on Earth to serve as plant food. CO2 is the source of ALL food on this planet, from the bottom of the food chain on up. Carbon, as in black carbon, is a real pollution concern. But that is not what the AGW fear mongers are referring to when they say "carbon pollution". They talk about how they care about the melting glaciers, but don't seem to understand how black carbon (soot, if you prefer) has a significant effect on reducing albedo of glaciers. Not to mention the obvious health concerns to everyone who breathes the air containing such particles. Yet...they fail to support the necessary steps to curtail this kind of carbon pollution, which would require giving the millions (billions?) of people who have no energy source except burning organic materials. What about deforestation? Have you seen what is happening to the world's forests in the push for bio-diesel? Do you know that in Germany, they will now be burning 1/3 coal and 2/3 wood? Where do you think this wood is going to come from? Do you think the consequences will be positive for the world's forests? I could go on, but you don't care. So, no. You don't get to re-define what it means to be an "environmentalist" to suit your twisted agenda. You don't get to re-define "carbon pollution" to a euphemism that suits your propaganda message. And you won't get away with your hijacking forever. Already many I know are refusing to call themselves environmentalists, resent being called so, and have adopted the term "conservationist" in order to distinguish themselves from the socialist watermelon cabal. You, my friend, are green on the outside and red inside. In other words, a socialist anti-environment hypocrite poseur. I will remain concerned for my family, the poor in this world and in particular the children, and will continue to work to defeat the AGW propaganda machine at every chance I get. In the meantime, I will continue to push for attention to be focused in the real issues that affect the lives of this planet's inhabitants. Real problems requiring real solutions. Let's start fracking all of Africa...now!!! If Newt & Republican's don't believe in global warming – tell them to put their money where there mouth is!! Why don't they take 1/2 their retirement and put in realistate on the coast!! You mean like al gore who bought, a six million dollar mansion in california on the ocean? I am not certain where Newt is getting his information that the climate has not warmed in the last 15 years. That is not the information published by the World Meteorological Organization in the graph here http://www.wmo.int/pages/mediacentre/press_releases/pr_976_en.html which clearly shows the first decade of this century as the hottest in the last 120 years. Is he just making up his 'facts' as he goes along? The satellite dataset know as RSS. It's a bit of a cherry pick, to be sure. But a variety of other datasets also show no warming, although for shorter periods of time. You talk about global warming can anyone tell me when the earth was at the perfect temp? Not sure, but how about the temp where the oceans don't warm up so fast, the polar and glacial ice slows it's melting, and the weather at any given location becomes a little more predictable from decade to decade? I don't know what the temp is, but it seems pretty clear that having the global temperature come down some would be a step in the right direction. CNN, stop elevating climate skepticism. Learn a lesson. These debates do not engender balanced discussion, they further an illusion of climate change doubt. The current arctic vortex is not fodder to fuel this. Major media organizations need to act more responsibly in their duty to the public and STOP sensationalizing this so-called "debate"! Please remember that your primary purpose is journalism. Not propaganda. There are very good arguments put forth by skeptics as well as the convinced, but the only calls for censorship are coming from the side of the debate that supports AGW mitigation at all costs. It is incumbent on your organization and others in media to continue to ask questions of both sides, and to present the views of all sides of this debate as new knowledge emerges. In a free world, an organization such as yours should not yield one tiny fraction of an inch when it comes to censorship of ideas, regardless of who makes the detestable call for such censorship. If the AGW debate today, then tomorrow, what...? THe problem is when you censure out facts and leave in mythical fairy tales, like those supported by the right wing nuts. You're assuming that there are two sides to present (is global warming occuring, yes or no), but in this case there aren't, there's just one. Yes, there are other points of view, but none of them credible (I live in Baltimore and it was really cold yesterday, but it doesn't make me doubt the decades long global trend). A better debate might have been what impacts will global warming on the US over the next 50 years? Or what changes should we be making and will they really have an impact, or is it just too late? Methane was touched on during the show, but I think you could debate the impact of C02 vs CH4 (methane) on global warming. Or maybe a show about whether or not the US has the ability anymore to lead the world on something as serious as global warming? You do't get to decide how many sides a debate has, or what the "right" way of thinking about the issue is. You don't get to decide what I think is credible, only what YOU think is credible. I know that's what you would like to do, but to date no one has succeeded at policing my thoughts, and neither will you and your friends. And I reject categorically the idea that censorship is fine in "this case" with "this issue". Freedom of though is like pregnancy, there is no in-between state. I wouldn't call it censorship, I'd call it filtering, and everyone does it all the time. The difference is that censorship is suppressing something that has a strong possibility of being true, filtering is suppressing something that has a strong possibility of being false. CNN should be filtering the information it presents, not censoring it. I said strong possibility because it's of course possible that global warming deniers are correct, but the overwhelming consensus among the experts is that there is a problem. And supposing the experts are correct we need to move the discussion to what can/should be done. CNN has a forum to do this in Crossfire, but the potential debate was hi-jacked because it's cold outside in parts of the US. You make a great point that we don't get to decide for each other what is credible. Turns out we don't get to decide for ourselves on most issues either. We turn to experts, they have debates, and look for consensus. We recognize that everyone won't agree and that in some cases some people may be hurt by the policies that we develop based on that consensus. The consensus may also be wrong, but we have to do the best we can with the information we have. Racism is sometimes okay too, not all racism, just racism against people we don't like. Murder is sometimes okay too, not all the time, just when we don't like those being murdered. Lying is often okay, especially if the cause is noble. Maligning someone's character...well, that's fine as long as the individual being maligned has "bad thoughts". Censorship is okay in this case, I guess, but only because the True Believers of AGW say it is. Yeah. Right. The fluidity of your morality, and that of your AGW friends, is more than a little scary. And BTW...I select, retain, instruct and listen to experts as a routine part of what I do. I pay a lot of money for expert advice, and would be a fool to disregard what I am told. That said, I will never let an expert decide what is credible, for me. That's my job. And further...your appeal to consensus is an appeal based on a logical fallacy. History is replete with cases where science (real science, I mean) overthrew the consensus view, many times against the resistance and inertia of consensus at great jeopardy to the non-conformist. The only thing consensus is indicative of in this case is the convergence of many vested interests. I'm trying to understand your perspective, it's a little difficult, but let me try to put it in my own words. You believe that all of the worlds leading experts on this issue have, for their own varying personal gains, colluded and reported a consensus on global warming. Us True Believes of AWG have bought their story and now are seeking to censor you specifically, as you are the world's decider of the credible – you read about consensus being an example of a logical fallacy and so you now know that anytime two or more people agree on anything it must be wrong, logic says so, and conversely since you are the only one who holds your position you must be right. You see yourself as someone like Galileo, showing all of these scientists and us True Believers of AWG the errors of our ways. To your first point: No, I don't believe it is the result of mass collusion, as this is practically impossible. Conspiracies occur among small groups...too many people involved. It is more likely a case of groupthink run amok. To your second point: There is a concerted effort to "lead" society in a direction by a process which relies on political propaganda, and most people are really just being carried along, doing as they are told. On credibility, I have written elsewhere, and you may well have misquoted me, that I will decide what is credible...for me. I do not claim the right to decide what is credible for anyone else. But I also reject the notion that anyone else will decide what is credible for me. On consensus, whenever anyone makes a sciency argument on the basis that the "consensus" is the reason why the claim should be accepted, the claim should be rejected. Replicated observations are the reason why claims should be accepted, and consensus of views has nothing to do with observation and replication. Wow, great, so we're past me being in some True Believer AWG cabal. But now the all of the experts are all together in a group (only way you can get groupthink) somewhere all of the time? I thought that most their time is spent with their own teams doing their various observations and replications. You're saying no, they are actually in a group somewhere, making up the data, giving in to hysterics and reporting out to everyone that they have a consensus in their views. Thankfully though, there's you, who not only sees though all of this smoke and mirrors but if all sides of an argument are presented and not censored, you will be able to deduce the credibility of the sources of information and come up with the right answer to every question...and I guess this enlightenment will empower the people to battle the evil forces that are directing society through their political propaganda? Time will tell. But yes, I do. I am not the only one.